FULLY fitted Car Mats are designed specifically for your Hyundai Tucson, to fit the shape of your foot wells. Hyundai Tucson 2015 - Onwards Fitted Car Floor Mats scores 4.4 out of 5 based on 10 ratings. Good value.Better quality than Hyundai. 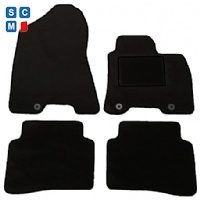 Great mats fit the car exactly and look very sturdy and hard wearing. Also delivered promptly. They fit well and look very smart.